Ghostly Mount, Hollow and Battle Seer! Welcome back, Ashes players! Earlier this week we introduced the new mount mechanic in Xander’s preview article. Today, we continue our exploration of mounts by seeing how Rimea summons these unique conjurations into battle! This summon spell has many interesting facets to it. 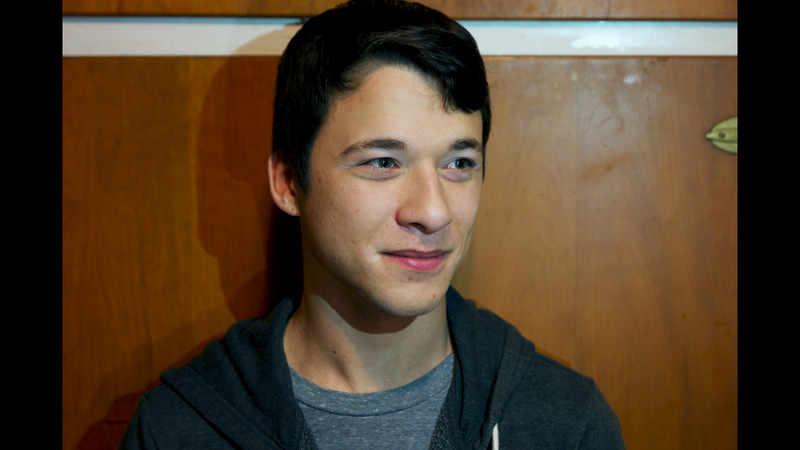 For starters, you may summon your Mount on whether a main or a side action to help smooth out the pace of your round. In addition to this choice, you have the option to summon either a Pale Steed Mount or a Spectral Charger Mount! These units are polar opposites, allowing you to choose the right unit to suit your needs in battle. 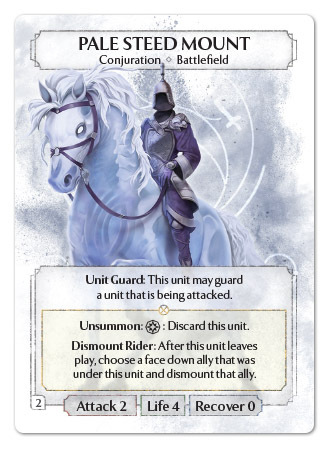 The Pale Steed Mount is a very bulky unit at 2/4/0 and boasting one of the most important abilities in the game: Unit Guard! This unit excels at absorbing incoming attacks, then dismounting its ally to unleash a stronger offensive threat! 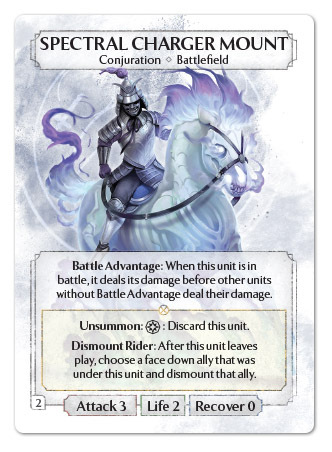 On the other hand, the Spectral Charger Mount is an aggressively built unit at 3/2/0 and has Battle Advantage! This unit puts the pressure on defending bulky units like Frostback Bear and Hammer Knight, so expect to get some free swipes in on enemy Phoenixborn when this unit charges into battle! 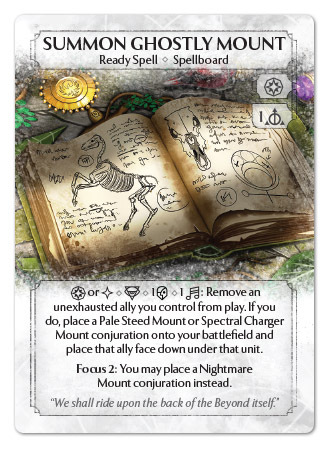 If you are skillful enough to get your Ghostly Mount book cranked up to Focus 2, you’ll gain the privilege of summoning the Nightmare Mount! Once you achieve this ability, the end is nigh, as the Nightmare Mount is one of the most fearsome units in all of Argaia! The 4/3/0 statline of this mount makes for some very threatening attacks, especially when paired with its Terrifying 2 ability. Common defenders, such as Gilder and Turtle Guard, will find themselves unable to stop an incoming Nightmare Mount! As strong as the Ghostly Mounts are, they are nothing without allies to bring them into play. 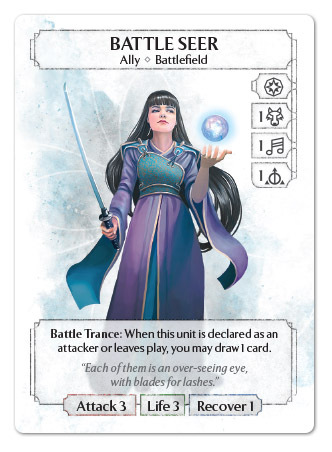 The Battle Seer is one such ally that is more than willing to mount up due to her special ability. Battle Trance allows you to draw a card when the Battle Seer attacks or leaves play, including when it is used to summon a mount. Even when not riding on a Ghostly Mount, the Battle Seer supports everyone’s first favorite steed, the Squall Stallion! This versatile and strong ally is sure to make an impact when it appears in the thick of battle. Lastly, we have the Hollow. This is one of the most flexible cards in the game with a dual-class parallel cost and two triggered abilities. The Hollow is also a great choice for summoning a mount, as doing so will allow you to use Possession to fully unexhaust a friendly unit for 1 SP! The Hollow’s impact on the game isn’t limited to being in play, either. 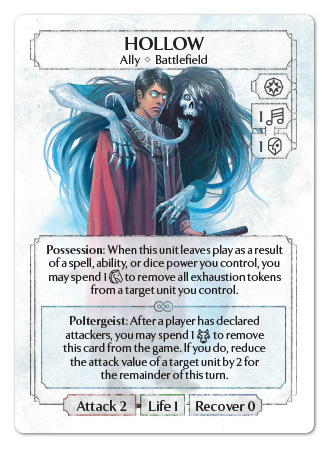 Poltergeist is a Between Realms effect that is active in your hand or discard pile. This alternative use of your IP dice can let you reduce the attack value of a target unit right after a player declares attackers! 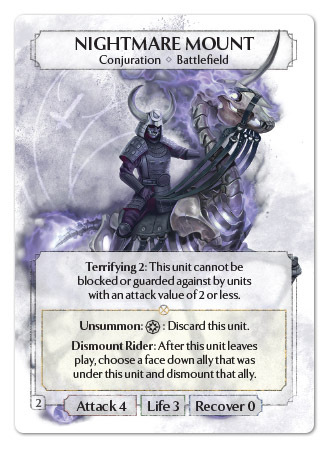 This can be used offensively with Nightmare Mount to maximize the potency of Terrifying 2, or defensively to surprise your opponent with a less than stellar plan of attack. If all of these options aren’t enough, a 2/1/0 for 1 class die is a cheap, aggressive ally for many decks! That’s all for today! Check back next week as we return to the King of Titans to explore some more dominating forces of Vallen.